Orson Welles’s Touch of Evil is one of the great pieces of cinematic trash. It’s a frantic film, wildly over the top, in love with its own squalor, infatuated with the feel and smell of decay. Among the director’s attempts at pulp, it is his masterpiece. At its center is Welles himself, joyously grotesque in the role of a bloated, degenerate cop named Hank Quinlan. In his small Texas border town, Quinlan is a legend, a fat redneck Sherlock Holmes who always gets his man. When a car bomb suddenly explodes on his side of the border, killing a rich developer and his girlfriend, Quinlan sets out to find the killer. Also investigating the bombing is a Mexican narcotics officer named Mike Vargas (Charlton Heston), a newlywed in town with his wife Susie (Janet Leigh). Vargas thinks the bombing might have something to do with a high profile case he’s working on involving a Mexican drug cartel headed by a goofball named Uncle Joe Grandi (Akim Tamiroff). Quinlan doesn’t want Vargas messing around in his investigation, probably because he’s already decided that the killer is the young Mexican who has been dating the dead man’s daughter. The film is a duel between the two lawmen, one corrupt and disintegrating, the other upright and honest to a fault. Surrounding them, in a torrent of activity, is a sprawling cast of oddities, from Quinlan’s faithful sidekick Menzies (Joseph Calleia) to a peculiar motel clerk played by Dennis Weaver. The film has the feel—both visually and thematically—of a spiral. Action drifts back and forth across the border, characters and plotlines come in and out of focus, but at the center of it, circling each other like fighters, are Quinlan and Vargas, each convinced that he is right, each increasingly convinced that the other is a bigger problem than the killer. By the end, they’ve both compromised themselves, and one of them lays dead, sinking into a drainage ditch between the borders of their countries. Since Welles is so associated with the high art of Citizen Kane and his masterful adaptations of Shakespeare and Kafka, it is easy to overlook his lifelong fondness for the kind of cheap, hardboiled stuff we now call noir. He loved paperback crime thrillers and claimed to have written some during his youthful sojourns in Europe. From his earliest days at RKO he had a desire to specialize in this sort of thing (before Kane, he planned to film a script called Smiler with a Knife). Journey into Fear, The Lady from Shanghai, and The Stranger were all early attempts at the genre. On his own in Europe, he labored to make Mr. Arkadin, and as late as the seventies, he helped plan an adaption of Jim Thompson’s masterpiece A Hell of A Woman and hired Bud Cort to play the lead. That project, like so many of his later projects had to be abandoned for lack of funds. As much as I would have loved to have seen Welles adapt Thompson, maybe it’s just as well that it didn’t happen. 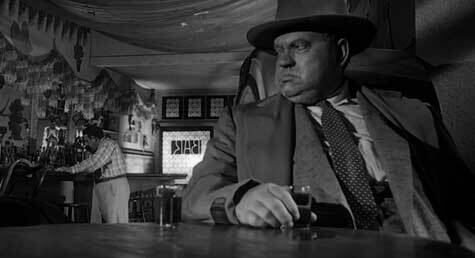 Touch of Evil is, in so many ways, the purest expression of everything Welles thought about pulp art. He had struggled before to put his vision of noir onscreen, and he directs this film as if it was his last chance (and of course it was). The film is relentless, pushed along by Henry Mancini’s blistering score. Camera setups—including, of course, the famous three minute opening shot—swing in and grab you and demand your attention. Trash blows down streets, people scurry in and out of frames (Akim Tamiroff unspools pages of dialog while he’s running). Crane shots swoop up and down, shadows splash across walls. The film is a whirlpool from start to finish. Even scenes that seem relatively sedate are tour de forces. Take a scene at the apartment of Quinlan’s prime suspect, Sanchez. The scene—filmed in long unbroken shots—lasts nearly ten minutes, drifting back and forth from room to room as the police sweat down the young man. It’s a complicated scene, made more complicated by the fact that Welles is slowly, subtly setting up the moment when Vargas realizes Quinlan has framed Sanchez. It’s a masterful piece of filmmaking. Or take an odd little scene a few minutes later, as Vargas uses the phone in a little store to call his wife. The blind shopkeeper sits behind him, pretending not to listen to his conversation. We get Heston in the foreground, the lady behind him, and behind her a sign that reads: If You Are Mean Enough to Steal From the Blind, Help Yourself. And he is. Hank Quinlan is one of Welles’s great creations. The director had always been obsessed with old men—they were the great constant in his work—but he had a brutal ambivalence about their disintegration. In Chimes at Midnight, he embraced the profound pathos of Falstaff’s tragic demise and made perhaps his most touching film. But Hank Quinlan, like Charles Foster Kane, is a monster—albeit a human one—and Welles is unflinching in his embrace of the big man’s fall. A film this manic can’t be perfect. Dennis Weaver’s portrayal of the Night Man—the manager of an isolated motel where Susie Vargas is terrorized by thugs—is the oddest character Welles ever put on screen (which, given the director’s fondness of absurdist clowns, is saying quite a lot). And while Heston does what he needs to do as the upright Vargas, it requires an act of forbearance to accept him as a Latino. But here I am pointing out the excesses of a film that luxuriates in its excesses. Touch of Evil is a wild night in a sleazy town. It’s great. Jake Hinkson is the author of several books, including the novel The Big Ugly, the newly-released short story collection The Deepening Shade, and the essay collection The Blind Alley: Exploring Film Noir's Forgotten Corners. Read all of Jake Hinkson's posts for Criminal Element. Paul Simon will not care for this interview. One of my favorite Bs "Crime Wave"